It is the physician at the local family practice who takes hydrocodone each evening after he closes the office … in order to relax & unwind. He successfully treated 25 adults & children that day. No one suspects he has a problem. It is a mother with a herniated disk taking a prescription for oxycontin to cope with chronic pain. She finds that she cannot get through the day without oxy. She received the teacher of the year award at her local school last week. No one knows about her problem. It is the college kid down the street known for making the Dean's list. Everyone in town loves this kid. She's been hiding a heroin addiction for almost 18 months. It is John, the likable get-it-done supervisor at a large factory. He's famous for meeting deadlines, producing results, and always doing the right thing by his employees. No one has a clue that he's been doctor shopping for a year to maintain a supply of percocet. It's your neighbor of 7 years that you have seen countless times mowing the lawn, checking the mail, and going to all the school functions. He's always been polite & considerate. In every respect, a truly wonderful neighbor. You don't know it, but he developed an opioid dependency, and has been receiving methadone for 2 years now. Is he any less a wonderful neighbor for this? The reality … is that anyone can develop a problem with opioids. Addiction is an equal opportunity illness. Addiction has powerful physical & genetic components. This is scientific fact. Some people will come through it ok using just a few resources. And still some will need both treatment & medication support. A fair number of people find that opioid replacement therapy is the answer they needed, due to dramatic brain chemistry changes which have occurred. Without the proper help & support, many intelligent & capable people will remain lost in their addiction … sometimes for years. As they struggle with physical sickness, emotional exhaustion, and mounting stress, their lives can literally fall apart. This is not necessary. Medication-assisted therapy has worked for many. Real Life 1: Sharon is a woman with a heroin addiction (dating back to her teen years) who became pregnant in her twenties. Realizing that she needed to get herself together, at least for the welfare of her unborn child, she entered a methadone treatment program. Her self-esteem had been hammered for years, often by family, but mostly by her own inner voice. After beginning daily methadone medication, she never used opiates again. After several attempts, she also achieved abstinence from Xanax, and remained completely drug free from that point forward. Real Life 2: When Kiley first presented to a clinic requesting to be placed in the methadone program, she was visibly depressed and physically emaciated from years of opiate abuse. She had lived with constant worry & stress trying to avoid withdrawal sickness. Amazingly, she was full time employed in a demanding job position. How she held down this job for so long was amazing in itself. After two months receiving methadone, Kiley became completely free of illicit drugs. Everything about her changed dramatically. She gained weight. Her depression lifted, and her mental clarity so much improved that it was like meeting a new person. Hidden under years of addiction-related exhaustion was a beautiful & capable human being with enormous ability and potential. Today, just short of two years on the program, Kiley has reclaimed her spirit and her life. She has confidence, is self-sufficient, employed, and building a new future for herself. Her parents, who were initially very skeptical about methadone, have achieved a newfound respect for methadone treatment programs and the healing power of opioid replacement therapy. Their apprehensions were erased when they got their daughter back, and that was priceless. Real Life 3: Franklin became addicted to opiates as a high school student. Following several years of a growing dependency, he found that he was unable to accomplish anything. His anxiety was constant, and he had been diagnosed with clinical depression. He became unproductive except to fight off being "sick" (opioid withdrawal) on a daily basis. When Franklin began methadone maintenance, he experienced the kind of relief he had been hoping for. Withdrawal sickness ended. Like many people, his energy returned. He began to get a grip on his life, and a new focus. Franklin applied to a major university, and was accepted. Fast forward 8 years. Franklin graduated from college in 4 years with a degree. He was then hired by a Fortune 500 corporation, and has presently been there for 4 years. Making a substantial salary, saving money, and moving up within the company. Franklin has met numerous challenges over the years and grown personally in so many ways. He has begun to taper down on his methadone dosage with a goal of becoming medication free within 12 to 18 months. He created a new life for himself … with medication assistance. Real Life 4: Steven is in his thirties and now in a methadone program. He spent all of his twenties physically dependent on opiates. He came from a family that had many problems of their own, and consequently he had practically no one in life to fall back on for support or guidance. So he learned to rely on himself, developed a great work ethic and an impressive sense of self-discipline. His one achilles heel was his long term opiate addiction. After fathering a daughter with special needs, Steven faced the music … finally. He had heard about methadone and decided he should give it a chance since everything else he had tried did not work. The decision paid off. Methadone provided excellent relief, and enabled Steven to disconnect from the drugs that had been a part of his life for over a decade. Today, he is full time employed and primary caregiver for a child that enjoys a dedicated, loving, and stable father. Counseling, support, and methadone medication made a big difference in Steven's life. And the benefits extended to far more than just himself. Real Life 5: As a younger man, Barry lived a chaotic existence as a heavy drug user. In and out of prison, Barry believed he must be destined for something better than this. Following a return to life outside of prison and then sadly back on heroin, Barry contacted the local methadone clinic. Very importantly, he had become ready for real change. 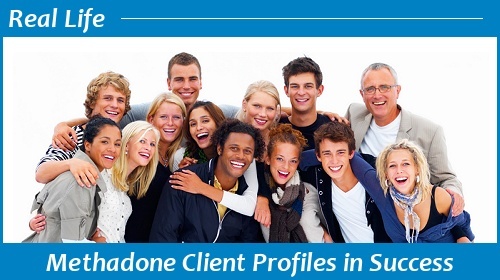 Fast forward 6 years, Barry worked successfully through all phases in his methadone treatment clinic. Along the way, he maintained steady employment, joined a church, resumed parenting of his child, and achieved take home medication status. And then he tapered completely off of methadone. Today, he is well respected, employed with a great company in a job he loves, and in a unique position to help others understand that recovery is real & change is possible. Barry became known as a generous person who was willing to share his personal message of hope with most anyone who was in need. Methadone treatment provided him a new path. He stayed on that path and followed it to the end. And there he found the life he had always wanted.